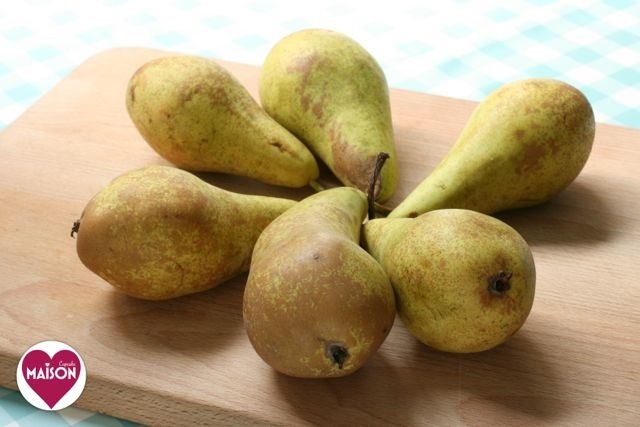 Pears are my ultimate autumn fruit. My dad used to have a pear tree at the top of his garden and every autumn we’d get bags and bags of them. The only problem was that they were often rock hard. 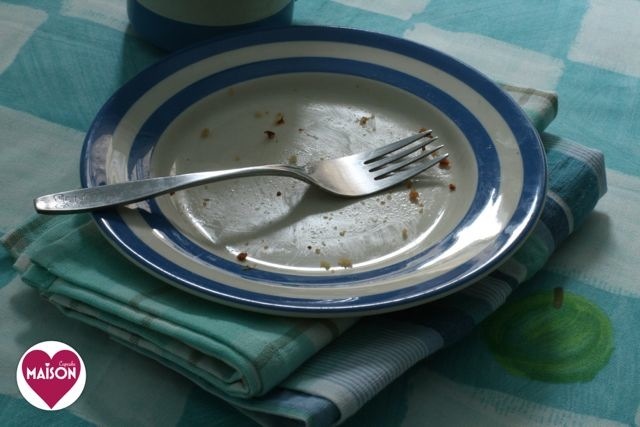 Which is great for storing but less satisfactory for immediate eating. What I didn’t realise then was that I could have cooked the pears; pears stewed in wine is a dead easy dessert, pears can be turned into compotes or cakes. When my dad turns up with the annual pear glut now I plenty of ideas how to use them. 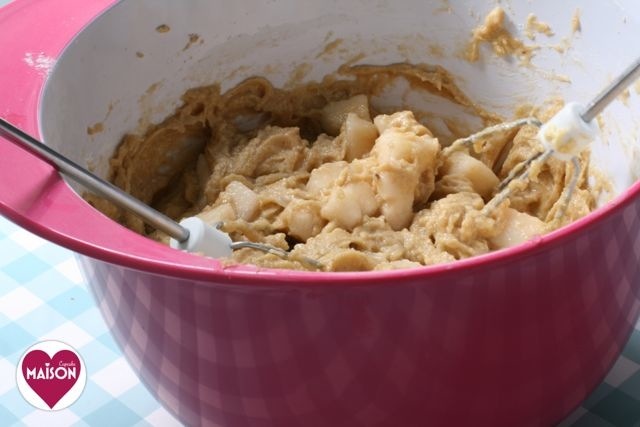 So I was quite stunned to realise, I’d actually only featured pears once on Maison Cupcake – in these pear and ginger spelt muffins that Ted helped me make during October half term back in 2011. 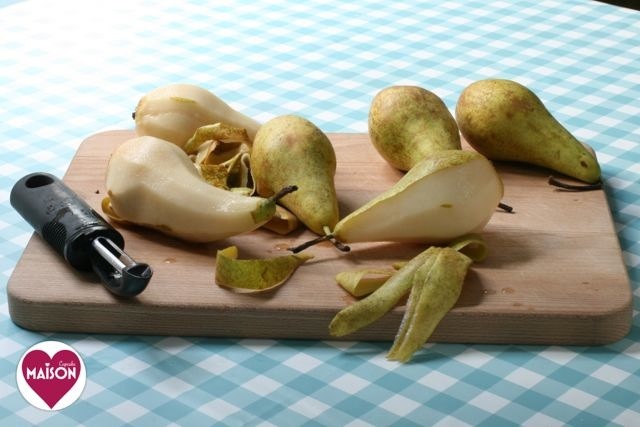 There were no problems with under-ripe pears from Fruitdrop.co.uk – theirs were perfect for eating and unlike some pears had a decent window of optimum ripeness i.e. didn’t turn into sawdusty mush within 48 hours. As was the case with all the fruit in our Fruitdrop box. The bananas didn’t go spotty for a week (we did store them separately from the rest of the fruit to lessen the speed of their ripening), we’re still chomping our way through the apples and even still have some grapes in the fridge. We joked at home that we had enough fruit to supply most of Ted’s infant school with their fruit snack that day. 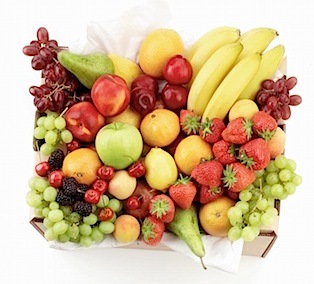 The generously sized Fruitdrop “essentials box” contains around 50 pieces including apples, bananas, satsumas, plums and pears with a a seasonal version including selections of berries, peaches/nectarines or figs / lychees / dates. The Fruitdrop boxes are primarily aimed at small and large businesses, however if you’re a big family getting through a lot of fruit and good neighbours with someone doing the same, it could work out for you too. The box we tried was a generous fortnight’s worth for a family of 4. The Fruitdrop boxes are delivered to your door from £20 per week. Fruitdrop are currently working with UK food bloggers to showcase recipes that can be made with their fruit boxes. Being a lover of pears I opted to make a gluten free pear cake which evolved into one containing pine nuts and salt caramel which you can preview below. I had made similar cakes using bottled Vahine caramels from France but for this I made my own. 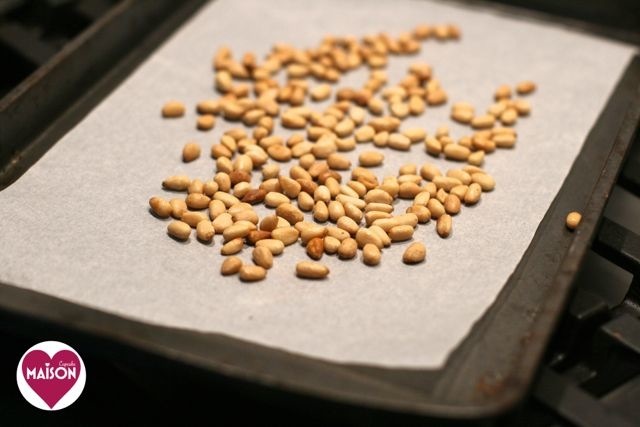 Pine nuts lightly toasted – make sure you don’t burn them. 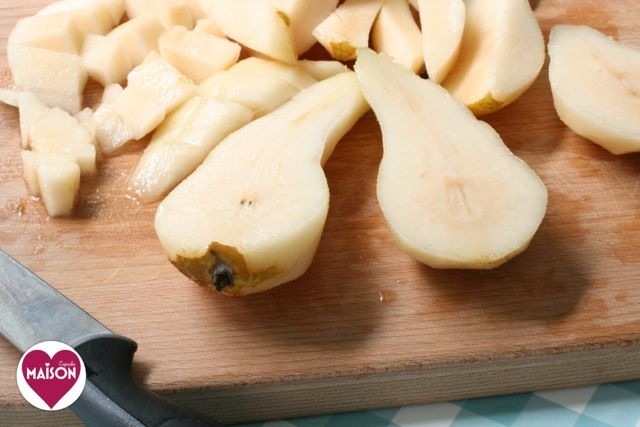 Juicy pears cut into chunks. 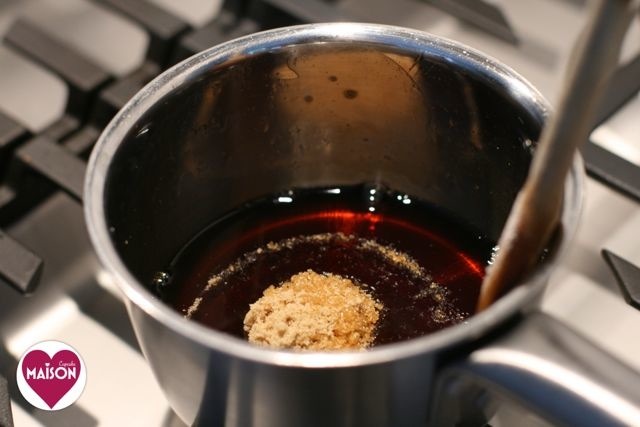 Before being lightly folded into the batter and poured into the prepared cake tin. 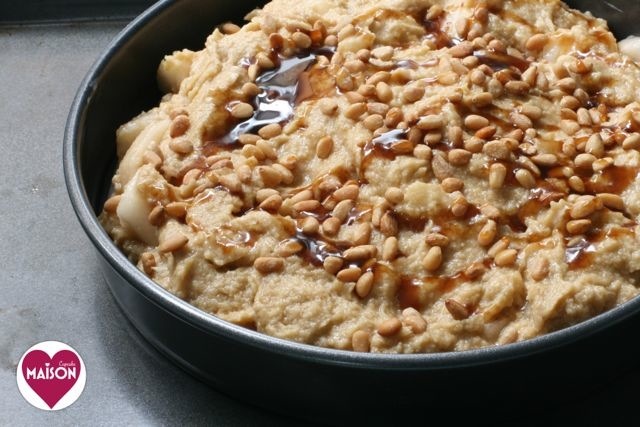 and drizzled with caramel and scattered with toasted pine nuts. If I’m honest, I rather fancied eating it like this. If you would like to see how my gluten free pear and pine nut Fruitdrop cake turned out then the recipe is now featured over on the Fruitdrop blog. Please do hop through to take a slice. Fruitbox picture and logo copyright Fruitdrop. Post and recipe commissioned by Fruitdrop for a fee.